The small, little known beachfront village called la Tamarissiere is tucked quietly away from the masses on a small stretch of coast at the mouth of the river Herault in between Agde and Cap d'Agde. Property in la Tamarissiere can prove to be a great investment for many many fun family holidays in the sun. Read more about property in la Tamarissiere and discover if it's right for you. The Domaine de Lavagnac, one of the finest examples of property in Languedoc we have seen for some time has just won several 5 star awards at the CNBC Arabiya European Property Awards, including best French golf development and best French development. This, along with the ever increasing numbers of unit reservations at Domaine de Lavagnac underlines the point that in a time of economic uncertainty, Languedoc property and specifically Herault property is still very popular and continues to be seen as a sound investment. If you would like to read about specific properties for sale at Domaine de Lavagnac then please follow this link and simply put LAV into the “Reference” box and then hit “SEARCH”. If you’d like to see details of general property in Languedoc or Property in Herault that we have for sale then follow this link and hit “SEARCH” in the search property box in the top right of the screen. What a Week in the world of property in Herault !! Yet another great week for new property in Herault area. I have taken on an amazing property in Marsillargues. This amazing Maison d'Maitre has a fabulous Centre Courtyard, just 2 minutes walk to the River and 20 minutes drive to La Grande Motte, beaches. I have also taken on a property in Cap d'Agde which is a really great Studio/Cabin. It has room to sleep 6. Great purchase price, located by the Port and only 5 minutes from the beach. Another fab new place is a property in CERS. Also a Maison d'Maitre, and just 10 minutes drive to 3 different beaches in the Herault. Finally a new property in Tourbes which is set in a fab location. It has a direct view over vineyards and is located in a small close only a few hundred metres from the centre of the village and only 5 mins from Property in Pezenas. A fabulous week for new property in Herault. Have a look at all these properties on our Languedoc property pages. I have just received this fabulous aerial photo of the Port du Roy Marina in Aigues Mortes sent to me by a client who is selling a fantastic detached villa with mooring and swimming pool. 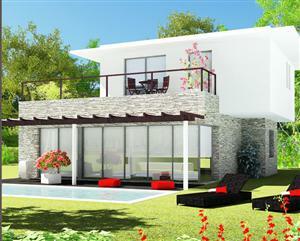 This detached villa can be viewed in detail by following this link. As you can see from the photo the Port du Roy marina is almost finished and by summer 2010 will be a very exciting place to be. I have just been instructed to sell one of the best houses I've seen in years. This Languedoc property is a modern villa of approx 167 sqm with a double garage, fabulous garden, large swimming pool and plenty of extra space including spa room and wine cellar. On the edge of a really nice village only 10 mins from the historic town of Pezenas, this Languedoc property has maintained to an exacting standard, has air-con throughout and has a fabulous view accross the local countryside. For more information about this villa (REF: ROUCOS) follow this link to read a full spec and see lots of photos of this Languedoc Property. Figures released by the French government show the property market starting to recover with sales of new homes in the second quarter of 2009 rising by almost 30% compared to the same period last year. As I keep saying...................Buy property in Languedoc now !!!!!! This year has not been quite the same as most other years. Normally I get to the end of August and look back at how quiet the property market has been. As you would expect, most people who are in Pezenas in July and August are here more for the beach than the property. This year has been slightly different. I've actually been very bust these last 2 months and have made a bunch of sales. Perhaps this is a sign of an improvong market, perhaps it's nothing. I personally feel that the market is bouncing back a bit and property in Pezenas is seeing a good level of interest from buyers compared to other parts of France. The Languedoc region of France continues to receive a good press and is now rapidly becoming the region of choice for people who are looking for a mixture of great weather, wonderful landscape and good value property. You only have to look at the WOW website to see how much there is to do in the Herault department alone to understand why Property in Languedoc, Property in Herault and in particular, Property in Pezenas is standing tall in the wake of an economic crisis. If you want my opinion this whole part of France is a very safe bet and slowly we are seeing more and more interesting properties for sale coming to the market at sensible prices. The moto of this story is this.....................buy in the Herault/Pezenas and buy now !!! An abandoned railway has been given a new lease of life by Velorail. Small railway wagons fitted with pedals allow you to glide down this fascinating track, through tunnels and over viaducts and all with breathtaking views of the valley de Cernon and the hills, rock outcrops and even cattle grazing in the fields. It also runs through what amounts to a nature reserve - all seen from these small railcars in close to silence. 2 routes are on offer - up-hill "les Papillons" is for the hearty as it is quite a pedal uphill - though coming back down is fun. In the other direction - "les Orchidees" is pretty pedal free after the first 300 meters and then a delightful glide down hill. And the bonus is - a train will come down after you and take you back to the top! We left at 11.ish and got back at around one o'clock - good value for €16 we thought and after working up an appetite - well judged for lunch - how very French. Each "car" has 2 pedaling positions and an easy seat for 2 more passengers. Even if you are not a rail fan you will enjoy it - not an anorak zone at all. Booking a good idea as the trips run in batches - full details on the website - just 2 trips a day in June but 4 or more in July. I have just come back from a site visit of a new project of 6 village houses in the village of Canet, just of the A75 near Clermont l'Herault. 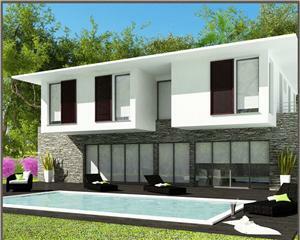 These properties in Canet are really starting to take shape and I have to say that I think they'r great. When I first saw the drawings last year I liked them but to be honest it's only now I've actually walked through them that they really apeal to me. Think of them as well laid out, good sized village houses with big garages and nice sized, wide terraces at first floor level leading out from the reception room. The prices are pretty much OK and I would strongly suggest a site visit to this property in Canet if you are lookig for a village house in the Herault in the 200,000€ region. I'll get details of these Languedoc properties onto our "Property for sale" section of the website over the next few days. Went to a friend's BBQ birthday lunch yesterday with my wife and children. On top of a little hill just outside the village of Faugeres, with stunning views over the local countryside. Food was great, music was good and all the children had a great time chasing each other through the garden sprinkler. All in all, a nice way to spend a Sunday. I have just returned from the Port du Roy marina development in Aigues Mortes where I have seen 3 lovely townhouses that may be coming onto the market and one FABULOUS villa that is definately coming onto the market. 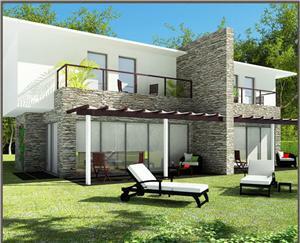 More details to follow but the villa is a 175 sqm, 4 bed detached villa on a 700 sqm plot with 13.5m mooring. The house has been very cleverly laid out taking into consideration the sun and the wind and boasts 2 terrases (one covered) and a lovely swimming pool. The property in Caux I was talking about the other day has now come onto the market at a very reasonable 199,000€. See full details of this property in Caux by following this link. Today I'm going to measure up a fab new Languedoc property that is coming onto the market. This Languedoc property is a three storey village house in Caux, just outside Pezenas, with 2 double bedrooms, garage, shared courtyard garden (very nice) and a separate studio apartment. The whole place is in fantastic condition and has the ever popular exposed beams and stone walls. The house is coming on at a very realistic 199,000€ and is sure to be a bit hit. Watch this space for more details on this wonderful Languedoc property. Is now the time to buy a property in France ????? • What's been happening recently? Things have definitely changed over the last 3-4 weeks and it seems that now may be the right time to buy a property in France. Activity levels have picked up fairly sharply both in terms of enquiries and client visits. What's interesting is that this has also filtered down into offers and sales. I've just looked through my stats and can tell you that in the last 5 weeks I've had 9 sets of clients over from the UK and Ireland. This may mean nothing to you but when I tell you that out of those 9 sets of clients, 8 have made offers on properties you can see why I'm feeling optimistic. I worked for 13 years as a central London Estate Agent and I can tell you that even there those conversion rates are fantastically high. This of course is the multi million pound question and I don't claim to be an economist but I can tell you this. The word on the street in the UK is that things have improved in many sectors. I have friends working in Estate Agency in central London who tell me that the last 4 weeks have shown a big improvement and they are generally very busy. One friend just posted his end of month figures for May which showed a very respectable number, even for a regular market. So people are feeling more optimistic in the UK. France is the same, although it didn't seem to hit here quite as badly anyway but that's another story. I have been banging on at sellers for what seems to be ages and ages to get realistic with their prices over here and it seems as though people are now beginning to wake up to reality. Other agents here are following suit so now I'm not the only one "Preaching the gospel". This has meant a shift in the quality of property for sale in this part of France for the better. Sure, there's still a lot of rubbish out there but more and more good properties are coming on to the market at realistic prices and more and more of these are selling. Buyers need to be excited by property. They want to buy but need to feel like they are buying well in order to make a commitment. • What are people buying? I suppose it's the same old mantra here really. Quality, location and character. A quality property doesn't have to be something that's been done up to the nines, it might need everything doing to it but still be a "Good" property. The biggest demand we have is for properties in pretty villages with a bit of life and a bit of commerce within a short drive of a proper town such as Pezenas. Pezenas works very well as it's kind of in the middle of everything. It's easy to see why this part of the Languedoc is so popular. Character properties have always been a favourite here as this part of France is steeped in history and us Brits like nothing better than a good bit of stone, brick and wood with a few stories behind it. I would say that 75% of my buyers are looking for an old stone property with wooden beams and the character of the old Mediterranean. However, this type of house with a garden is pretty hard to find so probably around 50% of buyers end up going for something different in order to buy into the whole private swimming pool thing. Let's be honest, going to the beach is fab but there's something rather special about having your own swimming pool. • What else is selling? The other types of properties that are doing well are a select group of high quality developments that are being built and/or planned at the moment. The Domaine de Lavagnac is attracting a lot of attention at the moment. This development was only launched a few weeks ago but has already attracted a lot of people to put down deposits and sign reservation forms. The Domaine de Lavagnac offers a stunning combination of 18 hole golf course and 400 year old Chateau set among 192 hectares of unspoilt woodlands and vineyards. The icing on the cake? A guaranteed return of 7% for the first bunch of reservations. Click here to see the properties for sale at the Domaine de Lavagnac. Simply type "LAV" into the search box and you will be presented with full details on all the properties available in the Domaine but hurry as the 7% deal is a limited offer. Another fabulous development that is attracting a lot of interest is the Chateau les Carrasses project near Beziers. This beautiful old Chateau with it's on site winery is being transformed into 28 high end units ranging from 1 bed apartments to family sized houses with private swimming pools. It's a different concept to the Lavagnac leaseback solution and is being bought for different reasons but again it's a high end development that has taken a good number of reservation deposits in its opening weeks. Click here to go to our property listings page and type KARLO into the reference search box to see details of what's available at the Chateau les Carrasses. • Where is the market going to go now? If I could answer this I would be writing this newsletter from a yacht in the Caribbean instead of my office in Pezenas. I can tell you that I don't think prices are about to start going up anytime soon but it does look as though they've stopped going down. It seems as though the clever money is starting to invest again and that's always a good sign. Generally speaking, someone doesn't have £500,000 sitting in a savings account in cash unless they've made a few wise calls in their time. So is it the right time to buy? Yes. I think it is. My advice is to jump on a plane and grab a good deal before someone else does. If you'd like to discuss your property requirements then call me on 00 33 467 00 11 71 or click here to go to our property search page. We might not have much, but what we do have is selling so we must be doing something right! Property in Baillargues, I just took on this delightful home in the historic village of Baillargues. Baillargues is a suburb of Montpellier and is a 15 minute drive to the centre of Montpellier. There is the best international (BAC) school, from Kindergarden to Lycee, less than 5 mins away. The Golf Course at the Massane is renowned as one of the best in this area. All facilities that you require are within walking distance. The property is ready to move into. Has a wonderful separate studio of 18M2. The house has maturing cherry and apricot trees, loaded with fruit this year! The front and back gardens are beautifully maintained. This house for sale in Baillargues is incredibly priced and should be viewed as soon as possible. Follow this link to see details of all our properties for sale including this house in Baillargues, or call me NOW to arrange a viewing on 06 68 14 46 08. I just had an interesting call from a client hoping to relocate to Montpellier. 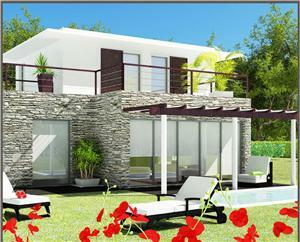 Property in Montpellier is their choice for living. The client also wants to open a business in central Montpellier too. This makes me think that a lot of changes are coming to central Montpellier. The clients decided on property in Montpellier having already tried Bordeaux. Montpellier property is far more interesting as we have the SUN and SEA and a wonderful City with great Universities located in centre. Watch this space to see how we progress. We have just added some new information pages to our list of towns and villages in the Herault department of the Languedoc. We now have pages on Property in Baillargues and Property in Castelnau-le-Lez (a very desirable area of Montpellier) so have a read and see what you think. I have just received these photos of the stunning leaseback development "Les Jardins de St.Benoit". You can see how well things have progresses here and how good the development is looking. There are still a few well placed units left for sale at Les Jardins de St.Benoit so if you like the look of these pictures contact me for more information or to arange a site visit. I have been speaking with various clients who have bought property in the Port du Roy development in Aigues Mortes who have asked me about Port du Roy property management. It seems that an awful lot of people in the Port du Roy would like someone to look after their houses while they're not there. People have asked for various levels of Port du Roy property management ranging from simple keyholding and a monthly security check to full cleaning and a welcome pack prior to their arrival. With this in mind I am talking to someone to see about putting property management in Port du Roy into action so if you have a house in Port du Roy or a Villa in Port du Roy contact me and tell me what you'd like. Also, if you want to talk about advertising your property to rent in Port du Roy, we are starting to put in place a system for this as well. I had my first "Full" tour of the beautiful Chateau les Carrasses yesterday. It took 2 hours but was well worth it. The Chateau les Carrasses sits comfortably in the rolling countryside just outside Capestang, about 15 mins from Beziers. The Chateau itself is to be turned into a collection of luxury apartments while it's various outbuildings are to be turned into a collection of houses with private gardens and swimming pools and a few apartments. The developer is focussing on quality rather than quantity and is only using existing buildings to convert. The local Mayor was quite happy to give permission for some new build on the plot but the developer was very clear in his vision for what this project was to be. Character, Quality, Lifestyle and Intimacy. With only 28 units being created I am confident that his vision is sound and I would highly recommend an early viewing. If you want to capture the spirit of this part of France but don't want to hassle of owning a second home and don't want to be tied into any kind of restrictive use then this is what you've been waiting for. The long awaited official launch of the stunning Domaine de Lavagnac is now here. Phase 1 is now available and reservations have already been taken. Early investors are being offered a guaranteed return of 7% !!!!! For those of you who don’t know this development, the Domaine de Lavagnac is being hailed as the most exciting development in the south of France. 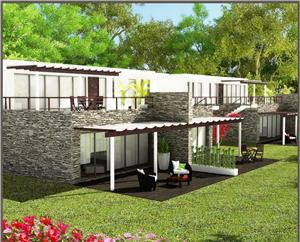 It combines luxury homes with modern architecture; an 18 hole championship golf course & clubhouse and a luxurious 1000m2 spa. All this encircles a 400-year old château better known as the ‘Versailles du Languedoc’ – which is to become the 5-star hotel, where you will sip champagne on limestone terraces overlooking the château’s formal gardens. The problem I’ve always had with most new developments in this part of the world is that they always look amazing in the artist’s impressions but more often than not have a compromised location. I can honestly say that as far I am concerned the situation of the Lavagnac project is nothing short of spectacular. One of the most interesting points about this project is the density of building relative to the overall site. The last thing you want from a luxury residential development is to feel like you’re crammed in to the site with loads of other people and haven’t got room to breath. With Lavagnac there will be no such concern, the building permissions that have been granted equate to permission to build on 3% of the total site which means that there will be plenty of wonderful, mature landscape for you to play golf in or simply go for a walk or a cycle. Option 1 Outright purchase – You can buy a property here as a second home and use it as and when you wish. As this option does not involve a “Leaseback commitment” there is no VAT saving. Option 2 Fifty/Fifty – A very attractive option in my opinion. You get up to six months of the year for personal use (excluding 1st 2 weeks of July and the month of August). 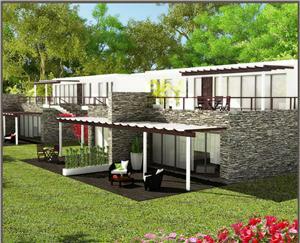 When not in personal use, the property will be added to the rental pool and be rented out by the management company. You will then receive a return of 50% on all net rental income. The big advantage here is that the property falls into the “Leaseback” scheme and as such you benefit from a VAT rebate of 19.6% which is a pretty nice saving. Option 3 Early investor deal – This option is only available on the first 106 properties in Phase 1. The property is bought under the leaseback scheme and buyers will receive a 7 % net return on their purchase which will cover the mortgage payments and outgoings. By way of example, a net purchase of €360,000 on a 2 bed apt will yield €25,200 per annum assuming a 10% deposit. This arrangement allows the buyer 1 week in High Season and three in Low Season and based on a fixed rate mortgage of 5% over 25 years. This is already proving to be of real interest to people and a number of reservations have already been taken. Click on a photo or a property name to be taken to a more detailed information page about that property directly on our website. I'm sure you will not be dissapointed with this development. It really does exactly what it says on the tin. The soon to be completed Port du Roy development in Aigues Mortes has been flagged by some as the new Port Grimaud. Is this true? I think it could well be. The two developments are basically the same. In fact, I have it on good authority that the principal architect behind the Port du Roy was a studying architect working on Port Grimaud many years ago. Both are marina developments made up of traditionally styled houses/cottages with roof terraces and small gardens with moorings at the bottom. This gives a really nice canal like feel to the marinas rather than just line after line of pontoons with boats moored up. While Port Grimaud is located on the Cote d'Azur not far from Saint Tropez, the Port du Roy marina is located in the heart of the Languedoc region of France, not far from Montpellier. As the Port du Roy nears completion I can really see it taking shape. Trees have now been planted and a reasonable number of people have moved in. There are even some houses to rent in Port du Roy that have come to the market and will be ready for this summer. Moorings are up to about 13m in length although if you have a longer boat then a villa to buy in Port du Roy or a villa to rent in Port du Roy could suit as these come with 15m moorings. All in all I think that this development is great and I really look forward to seeing it living and breathing when 100% of the houses have been delivered to their lucky owners and all the green areas have been planted. There's even going to be a Port du Roy bar/restaurant situated on the Quai d'Honneur marina. Whatch this space for further updates. I have just been speaking to someone regarding houses to rent in Port du Roy. This fabulous marina development is now nearing completion and houses to rent in Port du Roy could well be a hot ticket this summer. Have a look at www.heraultwhatson.info to find out what's going on in this department of the Languedoc. The site's creator and writer, Robin Hicks is surely one of, if not the most knowledgeable person for the "What's going on" side of life in the Herault. If Robin doesn't know about it then it's not worth knowing. Finally, after being in France since 2001 my dream development has come along. Since I moved from London to the Languedoc 8 years ago I have always thought that there was something missing from the property market here. There seemed to be loads and loads of developments springing up everywhere but none of them seemed to capture what I always belived was the spirit of this part of France. What I saw a real market for was a picturesque Domaine or Chateau in a beautiful setting with well situated out-buildings that could be converted into a small, bespoke, luxury development of individual houses or apartments with communal grounds, swimming pool, tennis court etc. The problem was that a) These buildings were close to impossible to find, b) I didn't have the money to do it and c) No-one else shared my vision. Instead developers were frantically running around building modern blocks of apartments in, what turned out to be more often than not, very compromised locations. I am please to say that finally, someone who shares my vision has come along and has just launched what I consider to be a truly outstanding project. Chateau les Carrasses lies just west of Beziers, in a beautiful setting just outside the village of Capestang so it's very convenient for the beach and airports alike. The Chateau les Carrasses is being reborn as a mixture of luxury apartments within the Chateau itself, plus luxury houses (some with private swimming pools) created from the Chateau's well spaced out-buildings. The developer is known to me and has a real eye for style, detail and quality of materials and finish. The Chateau les Carrasses is going to be one hot ticket this summer. Watch this space for more information or call me on 00 33 467 00 11 71 to chat about this fabulous project. The price for such luxury? 849,000€. We have just been instructed to sell a fabulous period property in Clapiers, a pretty village on the outskirts of Montpellier centre. For a full description plus some great photos have a look at our property for sale page. We have just made a new partnership with someone specialising in the Montpellier area of the Languedoc and as an introduction to this we have just uploaded a page about Property in Jacou, a village suburb of Montpellier. If you are looking for somewhere to stay near to Pezenas then we are pleased to recommend the Auberge du Chateau in the pretty village of Margon. I drove over to the Port Du Roy on Friday afternoon to have a look at a couple of houses that our clients have bought and are now ready for delivery. Not much else to say really except FANTASTIC. The whole marina is really coming together and looks amazing. Most of the development is looking pretty well finished now and there are a number of boats already moored up. I think that by the time we get to the summer this place will be looking very special indeed. There are still a few units left in the Port Du Roy including a couple of resales that we have. One on Quai Saint Louis with a 12m mooring and another in Marina Del Sol also with a large mooring. I have just come back from a really nice first floor apartment in the historic centre of Pezenas. This beautifully presented 2 bedroom apartment has two double bedrooms, bathrooms, modern kitchen and bright Reception room with high ceilings leading out onto a pretty roof terrace. This fantastic apartment is for sale at 205,000€. We have also now been instructed to sell a very cute village house with roof terrace in the pretty village of Pouzolles. With 2 double bderooms and a roof terrace this house is for sale at 139,500€ and will not be on the market for very long. I have just been to see a really nice village house in Pouzolles, just past Roujan. This 3 floor house is being refurbished to a high standard and has retained many of it's original features including some exposed stone and wooden beams. The house has 2 double bedrooms, small kitchen, living/dining room, newly fitted shower room and a pretty roof terrace for those long, lazy summer BBQ's. Pouzolles is a really nice village with great bar that serves food. The house is only about 2 mins walk from the bar/village centre and is likely to come onto the market in the next few weeks at a price circa 130,000€. Village houses with outside space at this price don't come around very often so if you're planning a viewing trip do give us a ring as I don't think this place will hang around. It's now the first week of February and as far as the property market is concerned we are now properly out of the Christmas period. It always takes a while for people to get their minds back to buying property after the Christmas break and starting back at work in Jan but I can report that since the last few days of January we have seen a marked increase in enquiries. It's true that we have had some very interesting properties come onto our books lately such as this wondeful family house in Roujan for 460,000€, a modern house in Caux with swimming pool for the same price and a really nice 2 bed holiday house in Pezenas with pretty garden and shared swimming pool for 155,000€. Not forgetting our newly listed barn with large garden ready to convert into your dream Languedoc Property. So if you're thinking of buying or selling in and around Pezenas give us a call for a chat.